South Australia's plan to store the world's radioactive waste also provides the necessary impetus for Australia's nuclear industry to begin the development of reactors. Noel Wauchope reports. THE SOUTH AUSTRALIAN government's promotional campaign for the Nuclear Fuel Cycle Royal Commission (NFCRC) continues to stress the economic gain to the State through importing nuclear wastes. However, recent pro-nuclear submissions to the South Australian Parliament’s Joint Committee on Findings of the Nuclear Fuel Cycle Royal Commission have instead focussed on the benefits of "new nuclear" technology, particularly "small modular reactors" (SMRs) — note how the word "nuclear" is left out since people distrust it. 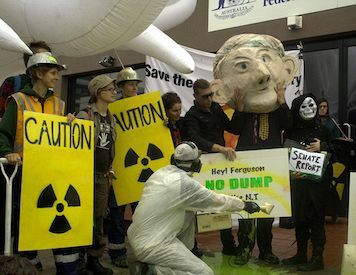 The global nuclear lobby is keenly interested in the South Australian government's plan to import nuclear waste, because it would solve the waste problem for nuclear companies wanting to sell reactors and particularly, new types of nuclear reactors, to Asian countries. This idea was pioneered by Australians and spelt out early in 2015, just as the NFCRC was starting, in an ABC Radio National talk by Oscar Archer. Since then, we haven't heard any more about this, as the whole emphasis in SA government propaganda, has been on the billions supposedly to be made by that state from importing nuclear wastes. The idea of developing new nuclear technology is mentioned in the NFCRC report (p56 and p63) but very much played down and not recommended for South Australia. Still, for foreign nuclear companies, the underlying aim is to further, or more correctly, to save, the nuclear industry by setting up new nuclear reactors, in particular SMRs. It is vital for the nuclear industry to have a nuclear waste disposal plan. The industry has pretty much given up on selling nuclear reactors to countries that already have nuclear power and they are struggling with the waste problem. The big hope is to sell to "new" countries. They are clearly looking to South Asia, as shown at the conference, The Prospects for Nuclear Power in the Asia Pacific Region, held in August, in Manila. The deputy director general of the International Atomic Energy Agency (IAEA) Mikhail Chudakov said that IAEA sees South Asia as a region where nuclear energy is "high on the agenda" and could be one of the drivers for global nuclear power deployment. The thing is, no country is going to embark on the nuclear power path – for small or large reactors – unless they have a prior plan for the disposal of radioactive wastes. This is vital for the nuclear industry — which is where Australia comes in. I was surprised that out of 55 submissions to the South Australian Joint Committee on Findings of the Nuclear Fuel Cycle Royal Commission, only five were pro-nuclear. However, despite the NFCRC's distinct lack of enthusiasm for new nuclear technology, three of those five submissions were focussed, not on waste importing, but on new nuclear reactors. Our research indicates that South Australia could make a significant contribution in this technology development beginning at a modest reinvestment of revenues from used fuel. Many nations in this region already exploit nuclear technology however this use is constrained by lack of a back-end solution…… The availability of a multinational solution for the back end of the nuclear fuel cycle could change these investment decisions profoundly. Heard backs up his argument by playing the climate card of nuclear being "low carbon" and so on. SACOME strongly believes that the advances in small modular reactors and advanced reactor designs will provide the necessary facilities to be able to service remote mine clusters and townships where economical to do so. Of the remaining two submissions, one from Leighton Smith was short — a very few lines of general support for the Nuclear Fuel Cycle Royal Commission waste import plan. And the other submission from Graeme Weber, was confined to a recommendation of the Gawler Range Volcanics as a site for waste facility. I understand that, for the Parliamentary Committee, all submissions were actually published. This is in contrast to the NFCRC process, in which submissions from interested parties such as foreign nuclear companies were kept confidential. State Nuclear Waste Storage Facility (Prohibition) Act 2000. Investigate Australia. Subscribe to IA for just $5 a month (or less).